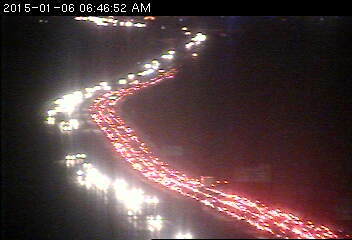 This whopper of a traffic jam on westbound I-494 is courtesy of a crash at Hwy. 5 blocking the left lane and a stall near Cedar Avenue. This is the scene from Pilot Knob Road and the bumper to bumper drive does not get any better until you reach Portland Avenue. Northbound Cedar Avenue is also starting to plug up from Cliff Road up to the Crosstown.